This image from a simulation shows the formation of islands during layer-by-layer growth of a gallium nitride crystal. In this image, each color corresponds to a different layer and snapshots are shown at different points in time. 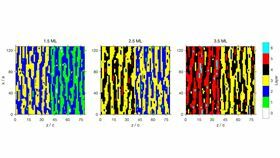 Scientists at Argonne National Laboratory have discovered that each layer tends to form in a pattern similar to the preceding layer. Image: Argonne National Laboratory. Understanding how crystals grow impacts broad areas of materials science, from developing better microelectronics to discovering new materials. At the atomic level, crystals can grow in several different ways, and scientists have now discovered an intriguing behavior associated with a common way that crystals grow. In this mode of crystal growth, called ‘layer-by-layer’, the surface of the crystal starts out very smooth at the atomic level. New atoms that arrive on the surface tend to skate around until they find each other. When this happens, they join together to form a new one-atom-thick layer, creating a flat region known as an island. As more atoms arrive, additional islands form at other places on the surface. Eventually the growing islands cover the whole surface, coalescing to form a new atomic layer. In a new study from the US Department of Energy's (DOE) Argonne National Laboratory, scientists have found that the seemingly random arrangement of islands that form to begin new layers can actually be very similar from layer to layer. The scientists report their findings in a paper in Nature Physics. Using coherent X-ray scattering techniques to observe the crystal surface at the atomic scale during crystal growth, the researchers were able to characterize the exact arrangements of the islands as they form, or ‘nucleate’, in each layer of the crystal. "You can think of what we're doing as something like making pancakes in a pan," explained Brian Stephenson from Argonne National Laboratory, who was an author of the paper. "As we randomly add more atomic 'batter', our pancake islands start to run together and coalesce. The interesting thing is that every time we grow a new layer, the pattern of pancakes repeats the pattern of the original layer." One important consideration that Stephenson noted is that the nucleation of new islands was not influenced by defects in the crystal structure – which is to say, it was not controlled by static regions where nucleation would be most likely to occur. "This is a dynamic relationship; the layer that is almost completely grown communicates with the layer that is beginning to grow on top of it," explained Argonne physicist Peter Zapol, another author of the paper. "The persistent patterns that we see indicate that there is communication between the layers," Stephenson said. "There is a vestige of the first layer that gives information to the next one." The ability to characterize the island patterns comes as a result of the researchers' use of coherent X-rays provided by Argonne's Advanced Photon Source, a DOE Office of Science User Facility. According to Stephenson, incoherent X-rays used in previous experiments were able to reveal only average features of the island landscape, while coherent beams are sensitive to the exact island arrangement. "The old way just told us the average spacing and shape of the islands – with coherent X-ray beams, we're able to generate a whole lot more information," he said. "The resolution has gotten so good that we're now able to resolve correlations across the whole sample, which means we can see things like this pattern that tell us how the islands relate to each other." Modeling growth dynamics at the atomic level helped the researchers to achieve a deeper understanding of crystal growth, Zapol said. "If we understand how crystals grow in this mode, we might be able to better understand some of the mechanisms behind defect formation, as well as develop techniques to synthesize new types of crystals."